Rachel was featured as EarHart Music Blog’s artist of the week where she shared a taste of her musical journey. Click the photo above to read her full interview. Rachel was invited to be a guest on AJ Johnston’s “The Culture Cult Podcast”. AJ and Rachel are very close friends and AJ’s interview couldn’t have felt more natural as the two of them discuss what it is like to pursue art/a music career in a city like New York. Rachel shares a bit of her story on how she landed in New York as well as what it is like navigating her career as an independent artist. the podcast is also available to stream on ITunes and Spotify. Rachel was featured as an up and coming artist on the Women's International Music Network! click the photo above for full post! 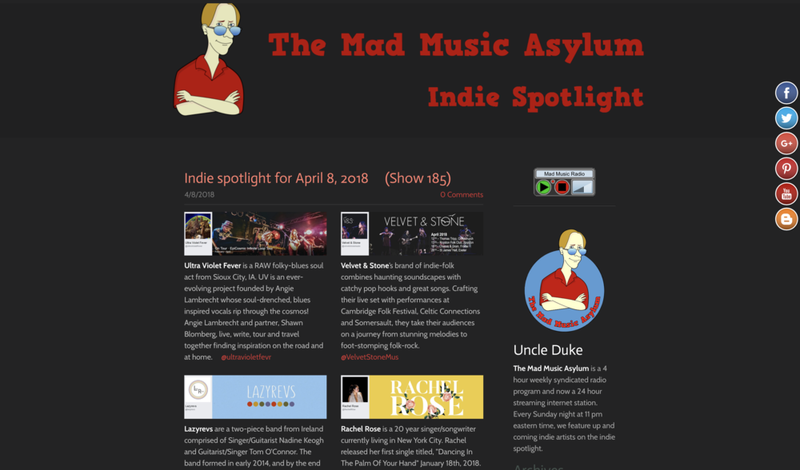 Rachel was featured on the Mad Music Asylum's Indie Spotlight for the week of April 8, 2018! click photo above for full post!